Compared with other parts of Denbighshire unemployment rates and other forms of deprivation are relatively low. However, there are small pockets of poverty and deprivation in individual households and in neighbourhood clusters such as at Clawdd Poncen. Median household incomes, in the area, where hit hard by the economic downturn after 2008 and have struggled to recover to pre -recession levels. Estimates show that incomes levels in households in Corwen were particularly hard hit by the downturn. In common with other parts of Denbighshire, the public sector is a major employer in the area. The Health and Social Care, Education and public administration sectors combined employ over a thousand Dee Valley residents. Manufacturing (516), Whole sale and retail trade (422) Accommodation and Food (298), Construction (276) and Agriculture (158) are also significant sectors. Agriculture and Forestry hold additional significance due to their land management role and the knock on impact this has for tourism and environmental resilience. Tourism is also of major significance to the local economy bringing in revenue to the area through retail trade, accommodation and food spend. The retail sector, like household incomes were hard hit town centre vacancies in Corwen increasing from 3 in 2008 to 9 by 2013 before falling back to 5 in the latest figures. In Llangollen vacancies rose from 8 in 2008 to 12 in 2014 before falling back to 9 in the latest figures. The completion of the steam railway extension to Corwen is seen as important development. This tourism asset helps broaden the tourism base across the Dee Valley helping more westerly parts of the valley build on the historic tourism successes of Llangollen. High profile events such as the Llangollen International Musical Eisteddfod, and Corwen Walking Festival bring in many visitors. In addition the valley abounds with tourism assets including the landscape, recognised as an Area of Outstanding Natural Beauty (AONB), many historic and heritage sites (discussed below) as well as a strong food, accommodation and activities offer. However, feedback from residents and Elected Members have expressed some concerns that restrictions associated with AONB status and heritage protection measures, can act as a ‘red tape’ barrier to some types of further investment. Concerns have also raised that a lack of parking in Llangollen harmed the prospects of further development in tourism and retail trade. The Dee is a major river with the some flooding risks at various points along the Valley. 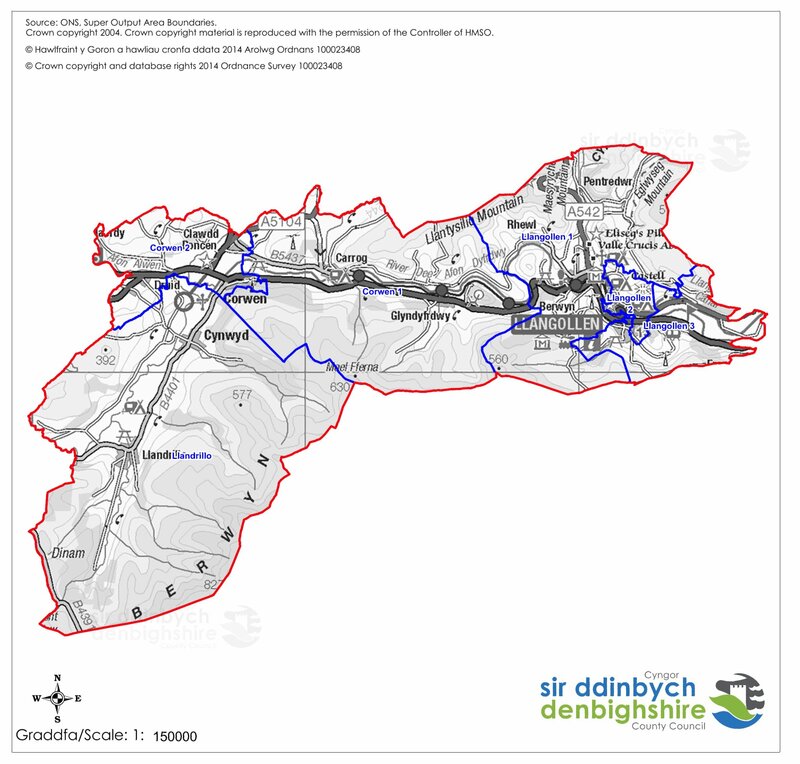 In recent years the Corwen area has suffered from several flooding incidents affecting homes, businesses and agricultural land. Engagement activities have revealed that there are some concern, in areas not affected by flooding, that flood risk designations unduly impact on future development and push up insurance costs. The Dee Valley AONB includes many significant habitats and sites of significance for biodiversity and geo-diversity. Links between land management, sustainable food production and tourism via collaborative work between the AONB and local food businesses in the Dee Valley to establish a food network – Llangollen and Dee Valley Good Grub Club. Transport and access to services are a matter of concern to some residents in the Dee Valley, particularly at its Western end. Llandrillo and communities outside of Corwen and Llangollen appear as relatively deprived in the Access to Services domain of the Welsh Index of Multiple Deprivation due to the relatively long travel times by public or private transport to local facilities such as GPs, dentists, shops and post offices. People living in these area may have a higher risk of social isolation. Recent high profile bus company bankruptcies are a cause for concern for the area. Key routes cross local authority boundaries including parts of Gwynedd, Denbighshire and Wrexham and require partnership working in transport planning and investment. There is growing interest in exploring the further development of renewable energy production in the area. The Corwen Hydro scheme is a leading development which has inspired interest in further possible developments including in other forms of power generation such as solar and wind to complement established wind turbines in neighbouring areas. The Dee Valley area has a number of health assets not least the countryside environment and the outdoor leisure facilities it offers. The countryside can play a key role in encouraging and enabling residents to choose healthy lifestyles. Work is planned to develop a Corwen Health walk to complement the existing Llangollen Health walk which will continue to be promoted. Community Miles routes will also be developed at the Sun Bank and Old Railway sites. More extensive walking routes in the Valley include a portion of the Offa’s Dyke route, Dee Valley Way, North Berwyn Way and Tegid Way. Annual walking festivals at Corwen and Llangollen provide a focus for promoting these activities to residents and visitors alike. There are also famous mountain biking trails in the Berwyn range above Cynwyd. The river itself offers opportunities for a range of water sports and angling. The range of sports clubs and facilities such as Corwen leisure centre, the sports ground at War Memorial Park / Parc Dyfrydwy, and the Llangollen leisure centre also provide opportunities for active lifestyles. Several private providers also offer gym and spa facilities in the area. In common with other parts of Denbighshire the Dee Valley has relatively high rates of older people (over 65) meaning that the impact of age related illness is likely to be felt more here than in other parts of the UK. Significant research suggests that the number of older people with dementia is set to increase. Numbers of people whose illnesses or frailty means that they are no-longer able to perform daily self-care tasks are also predicted to increase; making health in older age a priority for the area. At the western end of the Valley encompassing Llandrillo, Cynwyd and Corwen there have been some concerns about the ability of the market to meet demand for social care services. A partnership approach to developing the Cysgod y Gaer residential and day care site in Corwen is intended to mitigate this problem but increasing demands and a continuing difficult economic climate for home care, residential and nursing care providers means that this risk may remain into the future. The main community health assets are the Health Centre at Corwen and a new Health Centre developed at Llangollen bringing together GPs and a number of out-patient services formerly carried out at the now closed Llangollen Community Hospital. The vast majority people living in the Dee Valley identify as White with 99% in Corwen, Llandrillo and Llangollen 98%, this compares to 95% for Wales as a whole and 85% for England. In the Dee Valley 57% of people identified as being Welsh, 29% as British and 23% as English. Just 3% of the resident population has other national identities. This is similar to Denbighshire as a whole but the Dee valley has fewer people identifying as English (Denbighshire 27%) and more identifying as Welsh (Denbighshire 51%). Llangollen has a similar proportion of its population, who are disabled or experience a limiting long-term illness, to Denbighshire as a whole. This is higher than proportions across Wales. In the other parts of the Valley, at Corwen and Llandrillo the proportions are slightly lower. The Disability Sport swimming programme available at Corwen Leisure Centre is an example of directed services to support this group. There is little research about other protected characteristics that is specific to the Dee Valley area. Nevertheless, many of the challenges faced by different groups, described in other parts of this assessment, are likely to affect some Dee Valley residents too. In common with other part of Denbighshire and Conwy rates of crime and anti-social behaviour are low. Another common characteristic was the extent to which resident’s value and participate in community activities and volunteering. Examples include many sports clubs, music, arts and historical societies, religious organisations and charitable giving. The former Healthy Living Centre in Corwen was transferred to the community, enabling grant funding to be drawn down to improve information, community provision and youth work in the locality. Re-branded as Canolfan Ni the centre is now run by the South Denbighshire Community Partnership. Many community groups use the centre independently and in delivering collaborative programmes with Denbighshire County Council’s Youth Service. The Youth Service also work out of the Youth Centre in Llangollen engaging partners and local young people to deliver programmes that support community resilience. Llangollen town hall was also transferred into the management of Llangollen Town Council. Other community assets include Canolfan Glyndwr. From our engagement work we are aware of concerns about the affordability and availability of housing. The house price to average household income ratio for Corwen is estimated at 7.1 and for Llangollen 7.4. This compares with 5.04 in both Denbighshire as a whole and Wales meaning housing in the Dee valley is less likely to be affordable to local residents than is the case elsewhere in the country. The Dee Valley contains significant Welsh speaking communities particular in the Western part of the areas with as many as 60% Welsh speakers in Llandrillo, 46% in Corwen and down to around 20% in Llangollen (this still accounts for over 800 people). The Dee Valley is rich in both cultural and heritage assets. The area was home to Welsh leader Owain Glyndwr who is remembered in an historic statue and annual festival at Corwen. The Llangollen International Musical Eisteddfod is one of the longest standing and most culturally significant events in Wales attracting major performers and bringing in thousands of visitors each year. Llangollen Pavilion which hosts the Eisteddfod also host many events and conferences throughout the year. Telford’s Aqueduct, canal and Horseshoe Falls, which span the area from Llantysillio, through Llangollen and across the border into Froncysyllte are a World Heritage site celebrating a spectacular engineering feat of the Victorian age. The areas industrial heritage can also be seen in the range of industrial archaeological sites associated with the slate industry across the Berwyn Range. Past engineering achievements can also be seen in the majestic horseshoe pass and historic bridges crossing the Dee at Carrog and Llangollen, the Chain Bridge and road and rail combination at Berwyn. The Rhug Chapel, the old parish church at Llangar, Valley Crucis Abbey, Castell Dinas Bran, Eliseg’s pillar and Caer Drewyn Hillfort attest the areas significance in the Early Modern, Medieval, Early Christian and Iron Age periods, with the Berwyn Range and Llantysilio Mountain also containing a number of older Bronze Age monuments. The range of heritage, cultural and environmental assets and developments provides the Dee Valley’s contribution to a Globally Responsible Wales. Sustainability principles will be implemented through the Wellbeing Plan, Local Development and Regeneration Plans, biodiversity and conservation work.